After organising the Second Ever SteamPunk Magazine Steampunk Soiree in Oxford last year, we wanted to get our teeth into doing something else, and now we are! Over the weekend of 19th and 20th June this year, SteamPunk Magazine will be taking over the Little Marlborough Theatre in Brighton for the SteamPunk Magazine Seaside Spectacular. The weekend promises to be a typical bawdy weekend by the seaside with a distinctly steampunk flavour, with competitions, music, variety performances, dance lessons, burlesque, stalls, juggling, comedy, and whatever else we can manage to cram into the place. More information (and tickets) can be found on our Events page. As we are limited by the size of the venue, we are only able to sell 150 tickets for this event so if you want to come along then you had better get in quick! 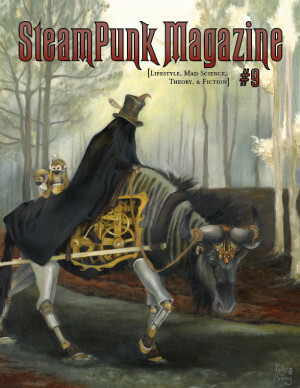 You can sell me tickets of SteamPunk Magazine Seaside only of one day? I travel from Spain and can go to brighton only on Saturday.